There is still time to enter the giveaway for a copy of Mark of the Demon by Diana Rowland. For details visit her guest post here. On May 5 I will be interviewing John Marco whose Starfinder YA fantasy novel releases that day. We will be giving away a signed copy of the book so stop by meet John Marco and ask a question or just say hello. Fantasy & Sci-Fi Lovin' Book Reviews has the most amazing giveaway ever with over 38 SF&F, urban fantasy and paranormal titles on the block. Literary Escapism has three huge giveaways going on including a Asian Heritage Month Giveaway, a Latino Book Month Giveaway and a Mother’s Day Giveaway. Wow! Chloe Neill, author of Some Girls Bite, and her agent Lucienne Diver hosted a chat earlier this week. Download the transcript here (doc format). Babbling About Books has an interview with author S.J. Day and a giveaway of Eve of Darkness. Carrie Vaughn does an interview with her publisher on Blog Talk Radio. 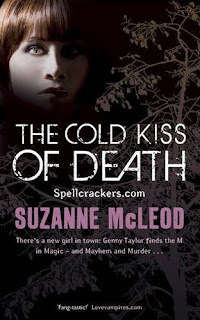 Suzanne McLeod has a giveaway of a signed proof copy of The Cold Kiss of Death the sequel to her urban fantasy The Sweet Scent of Blood. She will be running a weekly contest for eleven weeks until the books’ launch. Jackson Pierce has a giveaway - an ARC of As You Wish, a signed copy of The Forest Of Hands And Teeth by Carrie Ryan the Wonderful, and a signed copy of Faery Rebels by R.J. Anderson the fabulous. Watch her vlog below for details. Richelle Meads fourth Georgina Kincaid novel Succubus Heat comes out at the end of the month and she has posted an excerpt from the first chapter here for those of you that want an early look. She warns that there are spoilers from the previous book. The Suvudu Free Library has just added Lara Adrian’s urban fantasy novel Kiss of Midnight for free download. 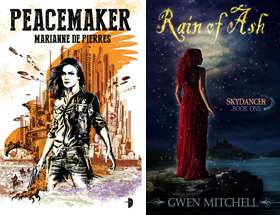 There are a number of excellent SF&F titles as well as urban fantasy available if you haven’t checked it out before. Advanced Reader Copies and More! All the books are autographed, naturally. Laura Anne Gilman, author of the excellent Retriever’s novels commence a new series called The Vineart War. 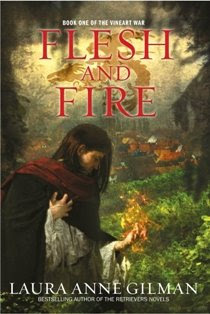 The first book is Flesh and Fire due for release October 13, 2009. If you have come across it before, Borders Books has a special page dedicated to Sookie Stackhouse/Charlaine Harris/True Blood at www.borders.com/trueblood. Only three days to the release of Dead and Gone. Can’t wait. I had the pleasure of being interviewed by Dallas at the Loving True Blood in Dallas blog on Blog Talk Radio Monday night. Here is the link. HBO has released the promo trailer for the second season of True Blood. It’s a musical promo called “It Hurts So Good” and utilizes Bob Dylan’s new single Beyond Here Lies Nothin. True Blood returns for its second season on HBO on June 14 at 9 p.m. ET/PT. Season one will be available on DVD, Blu-ray and digital download on May 19. The soundtrack will also drop on May 19. Don’t miss this post titled Reasons to be Missed by author Lynn Viehl over at the Genreality blog where she talks about the true nature of a writer’s legacy. It’s a wonderful read. Michele Hauf announced a new group blog for writers of Harlequin Nocturne’s. Check it out. Great contest recap, news recap! I've checked some of these out. Excellent giveaways. Lots of news and events coming up.